Over the course of two trips to Nepal and 1200 miles hiked across the Himalaya, I’ve ended up walking the Annapurna Circuit twice and Annapurna Base Camp once. I truly believe the Annapurna Circuit is one of the best hikes for beginner trekkers, especially beginners who don’t want to hire a guide. Additionally, the prices and scenery can’t be beat. Distance: 80-125 miles/ 130-200 kilometers; if you are also hiking to Annapurna Base Camp add an extra 70 miles/ 115 kilometers on to the total. The scenery drastically changes in a short amount of time. If you really want to pack in a lot of different landscapes into a short trek, then the Annapurna Circuit is for you. The trail starts by taking you through rice terraces that are cut into the sides of the Himalaya foothills. Then it climbs into barren, rocky mountains that reminded me of parts of Colorado. Upon reaching a high altitude, snowy peaks dominate the horizon. When the trail comes back down in altitude and heads toward the Annapurna Base Camp route, it is a jungle environment. There were even monkeys! The Annapurna Circuit has a lot of environmental diversity. You get to carry a light backpack. This is a guest house trek. You will walk through 5-8 villages a day, and they all have guest houses and restaurants. As much as I love camping, it was nice not having to carry a tent or cookware. I didn’t even carry a food bag with me; I ate three meals a day in guest houses. Having a low pack weight will be crucial once you reach altitude and every step is a struggle. Annapurna Circuit cost is low. This is such a low cost hike for what you get. I averaged $20 a day, and I probably could have gone lower if I had tried. My $20 a day typically got me a night in the guesthouse, three hot meals a day, a mid morning tea break, and the occasional beer. It’s important that you eat breakfast and dinner at your guesthouse because that’s where they make their money. There were a lot of nights that my accommodation was free in exchange for eating my meals there. If you need more information on this topic, refer to my Trekking in Nepal Costs & Budget article. How long does it take to hike the Annapurna Circuit? Typically they say that you can do the Annapurna Circuit in 18-20 days. If you are a new hiker or of average fitness, that sounds about right. For particularly strong hikers, expect to finish quicker. I did the Annapurna Circuit and the Annapurna Base Camp trek in 20 days (it usually takes 28-30 days), but I was in good hiking shape before arriving. Of course, if you want to hike for a shorter amount of time that is certainly possible. There are jeep roads passing through many of the villages. You can take a jeep up as far as the village of Manang. After Thorung La, you can get in a jeep again as soon as Muktinath or hike to Jomson to catch a bus. You could do the hike in as short as a week by taking jeeps, although you will miss a lot of good stuff and not acclimatize well. With new friends on Thorung La Pass. I recommend starting the circuit in Bahundanda. This is a little further than the bigger town of Besi Sahar. You should be able to stay on the bus that you took from Kathmandu or Pokhara to reach this further village. The road out of Besi Sahar is unremarkable, so you might as well skip it unless you have a strong desire to walk it. For those who have less time to complete their hike, it is possible to take Jeeps further along and skip even more of the circuit. However, I would caution that you are increasing the risk of acute mountain sickness by doing so. Having the extra days to gain slow elevation and acclimatize is critical. To get the full experience, I recommend hiking until the village of Tatopani and have a soak in their hot springs. You can then catch a bus back to Pokhara from there. If you’re short on time, you can catch buses as soon as Jomson after Thorung La pass. Of course, if you’re heading to Annapurna Base Camp you can just continue your hike. The two required permits are the TIMS card and the Annapurna Conservation Area Permit (ACAP). You can get both of these permits at the Nepal Tourism Board offices in Kathmandu and Pokhara (follow the links for Google Maps locations). Bring along two passport-sized photos, your passport, and a photocopy of your passport. The TIMS card is $20 and the ACAP is $32. Make sure you get them before your trek because the ACAP is double the price at the entrance of the Annapurna’s. The cheapest way is to take the local bus to Besi Sahar either from Kathmandu or Pokhara. You can stay on it further to Bahundanda, but Besi Sahar is a bigger town and people will know what you’re talking about if you ask for that bus. The bus will cost about $5 and take the entire day. Go buy your ticket the day before because it will leave very early in the morning and you will need to know when and where from. From Kathmandu, go to Gongabu Bus Station (also called the New Bus Station). It’s been a few years, but when I was there the ticket stand for Besi Sahar was not in the regular station. I had to walk further up the street, over a bridge, and ask the sellers there. If you’re leaving from Pokhara, ask for the local bus station because the tourist buses leave from a different location. There won’t be any ATMs on the Annapurna Circuit, except for maybe in Jomson. The Jomson ATM is not reliable, so don’t depend on using it. Take out all the money you will need for the entire hike. I always stay on the safe side and withdraw enough cash to spend $30/day. I never actually spend that much on treks, so then I just have leftover money for when I’m back in the city. Side note: ATMs in Nepal are unusual in that sometimes they just run out of money. It might seem like you’re having trouble with your card, but it’s probably just the ATM, especially if it’s evening time. Enough money for the whole hike. A guidebook or map. I like the Lonely Planet Trekking in Nepal guidebook, but you can also just pick up a map in the city. Outfit to hike in. Err on the conservative side as to not offend the locals. Warm outfit for the evening time. Water treatment method, like drops or a filter. Baby wipes or toilet paper. It won’t be in the bathrooms. Tampons/ menstrual cup/ etc. ; you won’t find any on trek. Evening entertainment, such as a book or cards. Can you hike without a guide or alone? I started the Annapurna Circuit without a guide or friends. The circuit is a pretty busy trek, so I quickly met people and made a few hiking buddies. The Annapurna’s are such a friendly region, that solo female trekkers will be fine. It’s very common for trekkers to hire guides and porters. There are just as many people with them as without them. If you have the money to hire a guide or porter then you should because it’s good for the economy in Nepal. If not, then don’t worry too much about it. The locals are incredibly friendly and helpful and it’s easy to find people who speak English. And you’ll meet lots of international hikers as well. Want to learn more about trekking in Nepal. I have a guidebook available for purchase called Tea House Treks of Nepal. It’s a compilation of all of my trekking knowledge I’ve gained from hiking 1200 miles across the trails of Nepal. Did you exchange your money for nepalese money before starting you trek? I’m planning to do this as well and I’m trying to figure out some of the logistics. I brought US dollars with me then I changed them in Kathmandu. I could also use my debit card in the ATMs for a $5 fee. Hey Hashbrown! I hiked the Appalachian Trail in 2015 as Goldilocks and finished in October. I read your book before my hike and I have to say it helped me immensely with my preparation and to calm my nerves. Your easy going advise helped drown out all the opinionated voices plastered all over the Internet and with that I began my hike. I checked your blog a couple days ago and am thrilled with your adventures. By chance I talked to a fellow hiker named Shaggy and he went on about a cool Ridge Runner he met in Vermont who was hiking in Napal now. I geeked out hard on him about how I read your book and was so jealous that I didn’t also get to meet you. I just thought I’d share this with you because of the amazing coincidence. I hope all is well! Hike on girl! Hey Goldilocks! That’s so crazy. I remember chatting with Shaggy for a long time on top of Bear Mtn. Connecticut. I’m happy my book helped you out. Good luck on your future adventures!!! I moved to Nepal last summer and am about to do my first walk (village to village) outside of Pokhara in April. 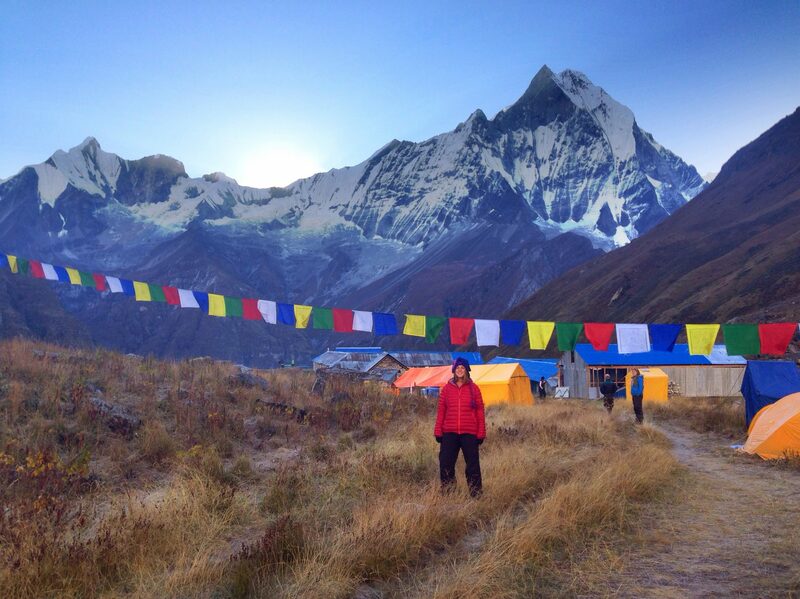 My goal is to do the Annapurna Circuit in 2017 — so glad to have found this blog! Glad you were here last year and encouraging people to come back to Nepal. So I’ve been in thialand for about a month and I’m scheduled to start a group Treck on Saturday. I’ve been volunteering with kids an somehow managed to get a cold. I’m on medication and I’ve been takin it easy, but I’m totally worried I won’t make it if I climb with a cough and runny nose. Any advice would be great! Hey thanks for this page. I’m getting ready to go and your notes are super handy! Sweet! Let me know if you have any questions!! Receive the Beginner's Backpacking Ebook and never miss a blog post. Hi, I'm Megan, and this is my outdoor travel blog. I'm a long distance hiker, author, and wilderness professional. I travel all over the world in search of mountains, and I keep this blog to inspire others to hit the trail.